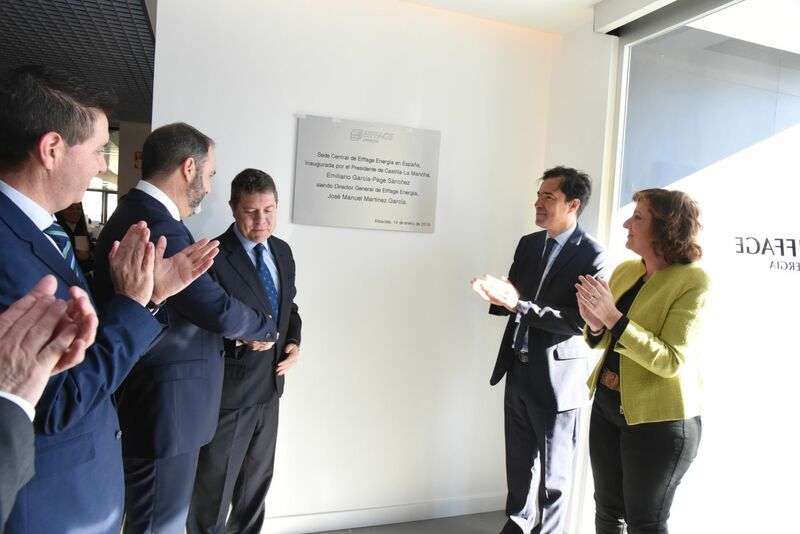 Today, the president of Castilla-La Mancha, Emiliano García Page, has inaugurated the new head offices of Eiffage Energía in Spain, located in Albacete in a ceremony attended by the CEO of Eiffage Energía, José Manuel Martínez, as host, international CEO of Eiffage Énergie Systemes, Ludovic Duplan, institutional and business representatives as well as regional and subsidiaries directors of the company. The new building, which brings together in the same workplace Central Services, the Territorial Centre, Conscytec, Renewable Energy and Maintenance departments as well as communal services that include 280 parking spaces, a training centre, a cafeteria and meeting rooms has been a direct investment of about 5 million euros. It is, as explained by the CEO of Eiffage Energía, José Manuel Martínez, “a move forward in the strategy of centralisation and integration of departments which allows to optimise resources, increase synergies and thus improve productivity and profitability”. José Manuel Martínez, who had words of gratitude for the president of Castilla-La Mancha “for being present on such an important day for Eiffage Energía and for fulfilling the commitment made just over a year ago, when we laid the first stone of a project that today is a reality,” emphasised that the new head offices of Eiffage Energía “are a symbol of the current period that this company, which has just had its 15 year anniversary, is going through“. 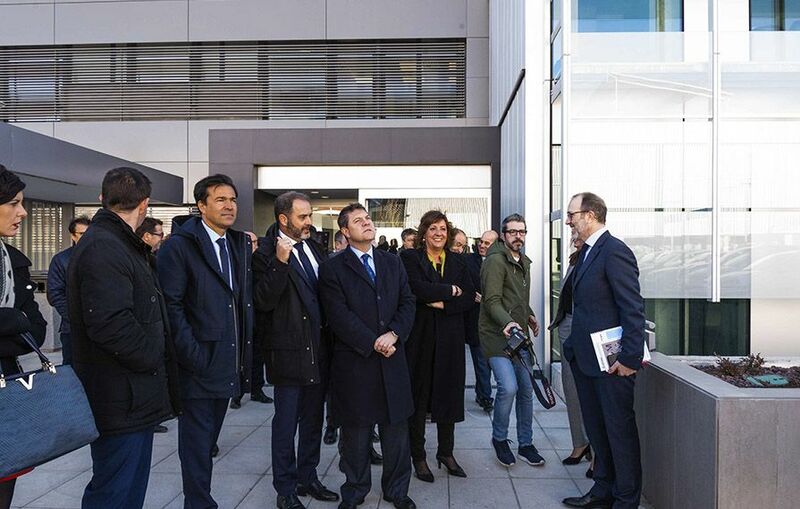 In this respect, Martínez let it be known that in 2018 Eiffage Energía’s turnover stood at 440 million euros with a workforce of 3,250 workers, of which about 250 are developing their work in the new building. In this respect, the president of Castilla-la Mancha congratulated Eiffage Energía on being one of the most important companies in the region “and because the creation of jobs and skilled jobs is what the public is interested in”. “We are leaders in enterprise creation data, in assistance in job creation and in establishing companies,” said García-Page in his speech. Since its inception, the head offices of Eiffage Energía have been in Albacete, making this province and, consequently, Castilla-La Mancha, a benchmark region on the subject of renewable energies worldwide. As it could not be any other way, the new head offices of Eiffage Energía are geared to be a benchmark for Sustainability and Energy Efficiency incorporating technical specifications of eco-efficient materials and systems and installations that increase energy efficiency and reduce consumption and, therefore, environmental impact. The complex is equipped with, among others, Photovoltaic Solar installation for generating electricity; Aerothermal Solar installation and Biomass Plant for thermal power generation; rainwater recovery system for irrigation; integrated LED lighting; EMS system for monitoring and control; recharging points for electric vehicles; as well as passive solar protection systems in all the buildings, among other things. It means, ultimately, to provide the best conditions and environment that significantly facilitate the daily lives of the workers. You can see more about the ceremony in this video.